More next post on why Meyer's thoughts about hospitality as doing something "for" in stead of "to" people is right in line with the church's mission and could, if practiced consistently head off some of the kinds of things that Collins points back to and we can see all around us in our own culture today. Another installment in my series on lessons in “hospitality” learned from a restaurant owner and applied to our work in the church. Beth and I threw the backpack in the back of the old pick up and piled in. Our guide, Jorge, smiled warmly and struck up an awkward conversation in broken English. I responded with broken Spanish and for the next five hours we continued on that way. 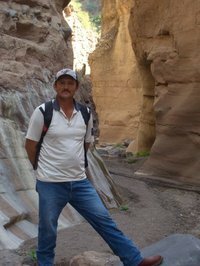 We headed out a dirt road, through a little fishing pueblo called Ensenada Blanca, and into a desert slot canyon, where we would spend the day hiking. We were greeted by burros with bells, tiny frogs, unexpected foliage in the trickling stream, and dramatic canyon views. It was Beth and my 18th anniversary and it was a wonderful day. Once Jorge figured out that I wanted to practice my Spanish, he mostly let his English go. But that was for my benefit, not his. (As I have written before “el mundo esta mi professor.”) We talked throughout the day in what was probably the Spanish equivalent of a 3-year-old child. But all the while Jorge, continued to communicate warmth, laughter and friendliness. He continued to make sure that we were safe and having a good time. He was a perfect guide. A very sweet moment along the way came when Jorge asked what I did for a living. When I told him that I was a pastor his eyes sparkled and his face broke into a large grin. He tapped his heart and said that he was very pleased. He told me that his sisters were Christians and that they read the Bible everyday. (Then I “shared my faith” for the first time in another language. I looked at him and said, “y usted?”) He told me that his sisters were evangelicals, but that out of respect for his parents (he’s the oldest son) he has remained a Catholic. But that he was growing in his faith. Throughout the day, there were few complicated words, but much warmth. There was little deep communication, but genuine growing feelings. I look back and marvel at how much Jorge was able to communicate to us in the most basic Spanish terms. When he dropped us off back at Danzante Eco-Resort, I gladly gave him a big tip. As my staff and I have reflected on this illustration we have realized that very often we so focus the tasks (brightness) that we are oftentimes simply "blinding" people who we should be attracting with "warmth" or the feeling that we engender in people in our encounters with them. Now as I have used this illustration with my staff, Jorge, is the example that I offer of the perfect 51/49er. He was an excellent guide, who knew the area, pointed out all the best things we wouldn’t have seen on our own, kept us safe, attended to us as his clients. (49% task is still really significant and all the "warmth" in the world wouldn't have mattered if Jorge, our guide got us lost, or didn't know the area, or didn't keep us safe.) But he also emanated a warmth of care, concern, friendliness, attention, respect and welcome—and all of that without using our native language. When I think of what I want our church to be, especially for “foreigners” to the church—those unchurched who come across our community seeking God and not really knowing the “language” or “customs” of Christian faith—I think of a lightbulb, moths and Jorge. And continue to ask God to make his church more and more a reflection of the light and warmth of the One who is the "bright morning star." According to Danny Meyer, hospitality is found in the small things. Like prepositions. In what ways are you aware of the ministry of the church as “to” or “for”? Want to share some stories? Maybe we’ll discover ways of truly representing the one who “gave himself up for us all”. Last week, I offered the first post in a new series on "Transforming Hospitality". After a week of conferences, funerals and some extra duties to squeeze, I am finally in a place to offer up the next post. Sorry for the delay. When one first hears these instructions, it seems both counter-intuitive and selfish. If I am assisting my children, my aging grandmother or any person sitting next to me that needs help in breathing, it seems that the right thing to do is to help the other person first, right? Wrong. In a similar way, Danny Meyer’s concept of “enlightened hospitality” begins not with serving the customer but with serving first the employees. 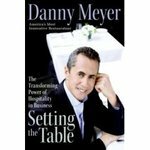 In his book, Setting the Table: The Transforming Power of Hospitality in Business, Meyer writes that the first and most important application of hospitality is to the people who work for you, and then, in descending order of priority, to the guests, the community, the suppliers, and the investors. According to a recent article in the Orange County Register, up to 80% of people are deeply dissatisfied with their work and their workplace. It seems logical that that dissatisfaction is naturally “flows” to customers. But, if Meyer is correct, one of the foremost responsibilities of management must be attending to the “atmosphere” of the workplace. In other words, if we want “hospitality” to be the culture of a place, the “air” we breathe, the ethos we exude, then it must first and foremost “flow” to those it is going to flow from. When we were in Mexico at the Danzante Eco-Resort, we were most impressed by the fact that everybody on Mike and Lauren Farley’s staff were local Mexicans from the little fishing pueblo of Ensenada Blanca. When they inquired about buying the land, they asked permission from the local “godfather” (even though he didn’t personally own it). When they constructed the resort, they hired local workers as builders and local women to cook the food for the workers. Those women later became the chefs for the inn and they brought their recipes with them giving the resort very authentic (and delicious) food. They brought in consultants to train local women in massage, they sell local crafts, they hired local rancheros as guides and they pour money back into the community by supporting a school and a dormitory for the rural kids who can’t afford secondary school (any education beyond the ninth grade requires tuition in Mexico). By letting their hospitality flow first to their staff and neighbors, they have created an “atmosphere” of hospitality that is evident from the very first moment you arrive. In a similar way, I would like to suggest that recapturing hospitality as a “transforming power” of a local church begins with the way the church staff is treated. And to make the first priority of church leadership to offer hospitality to the church staff will be a radical move to transform the whole church culture. Very often, church staffs are overworked, overstressed, undervalued, and underpaid. They are treated like domestic servants who are supposed to jump at the beck and call of every “dues-paying club member” who is part of the church community. The pastor’s family, personal health and growth are often sacrificed in the name of “servanthood” and yet very often, it is the administrative assistant, associate pastor or custodian who is expected to do even more. Is it any wonder that most churches that so preach serving and welcoming others struggle with exuding a "air" that is different than any other institution. Now, granted church staffs operate on pretty strict budgets. We aren’t able to offer the salaries nor all the benefits that I would like to be able to offer even my team. But generous vacation and family leave time, flexible schedules, opportunities for training, a collegial atmosphere, celebrations and affirmation, a good dose of fun, and a congregation with leaders who are really good at caring for us on the staff goes a long, long way. When I first came to San Clemente Presbyterian Church, an older man who was part of the nominating committee that called me, pledged to me, “My wife and I believe we are called to help you and Beth have a great ministry and a great life here in San Clemente. Whatever you need—whatever—you just call us and we’ll help you.” That couple has been more than good on their word and that pledge they made to me has been my inspiration for what I want for my staff. Last month at Christmas time, I had the enviable position of giving out bonuses to all the staff at SCPC. We budget on a fiscal year (June-July) and since the new budget cycle six months earlier fell in the middle of my sabbatical (and since we were unsure of the financial impact of my sabbatical) the church Session decided not to give any raises right away. We genuinely worried that if the finances took a serious turn south, then we’d end up having to lay people off (church budgets are disproportionately in “people” costs.) But instead of just “cutting the budget”, the Session set aside the entire “cost of living” pool for six months and when the finances were solid at years-end, distributed to all the staff who had served so faithfully during the sabbatical months. Church staffs don’t expect “Christmas bonuses” (in 20 years of church life, I have received one and now given out two), but a bit of extra unexpected generosity certainly goes along way now and then to fill the air with some genuine warmth and energy. During the days before Christmas I read a business book that absolutely captivated me. Danny Meyer's book, Setting the Table: The Transforming Power of Hospitality in Business is the most inspiring and challenging book for my thinking about leadership and the church since I read Jim Collins' Good to Great. What was so inspiring? That Meyer, a restaurant owner, was speaking my language. Hospitality is the language of the true Christian community. And building and leading Christian Communities as place of welcome and witness to the presence of God's Kingdom as been my life work. What was so challenging? That Danny Meyer explains the nuts and bolts, the competency and conviction, the power and the indeed, the PROFIT of hospitality better than I ever have. As I read the book, I kept thinking. "Oh man, he has figured out how to make money offering people the experience of what the church is supposed to give for free!" So, a couple of weeks ago, I decided that one of my next blog series would be on the "Transforming Power of Hospitality". I wanted to take the lessons so articulated from Meyer and apply them to the place where we welcome people in the name of God to the feast for all of creation. Then after reading, thinking, even doing some training of my staff on the concept, I got the chance to experience some good old fashioned "old world" hospitality last weekend when I traveled to Danzante Eco Resort in Baja, California. Not only was the place beautiful, remote, restful and restorative, but the owners Mike and Lauren Farley are calm, attentive and a caring hosts. They enjoyed us as guests, told great stories (Mike worked for Wild Kingdom with Marlin Perkins) and encouraged each guest to truly make the most of their stay. They epitomized everything that I had been reading and thinking about. Danzante Eco Resort is a wonderful, magical place nestled in a simple fishing village on a beautiful bay (See "Baja" photo album at right). Mike and Lauren are Americans whose lives are given over to enjoying and enhancing the lives of their friends and neighbors. In the days ahead I am going to share some reflection on the "principles" that I have been re-learning from Meyer's book and experienced first hand from two new American friends and a village of Mexican people. My prayer is that some day, the church (starting with my own) would recover the simple, divinely-inspired vocation that is the 'transforming power of hospitality'.